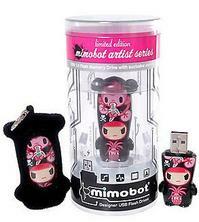 We love a good USB drive here at Shiny, and none more so then the endlessly delicious Mimobots! Well we’re giving you lovely folks the chance to win one of your own as we have five of these lovely fellas to give away. They come equipped with a variety of wallpapers and funky icons stored on them, as well as a bunch of cute stickers, making this more than your average USB stick. To win, simply send your name, address and the answer to this address by the 21st Feb 2009. How many items are there in the Tokidoki category? See here for our T&C’s.